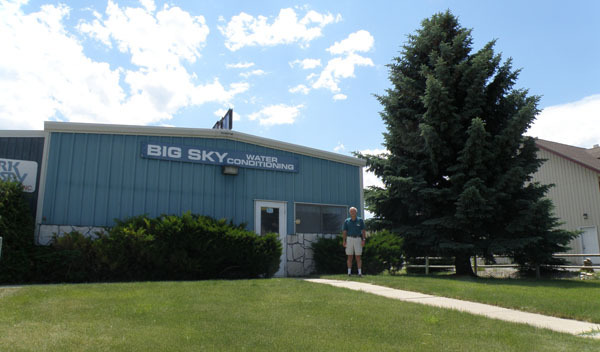 Big Sky Water Conditioning | Why do I Need a Water Softener? Why Do I Need A Softener? Even if your water is safe to drink, there are all kinds of reasons to make sure you have soft water. From pipes to dishes to laundry to your bath or shower, soft water makes a huge -- and often cost-saving -- difference. Most water contains more than water. Almost all of the water found in the U.S. is hard water. Hard water is water that is contaminated with dissolved minerals – like calcium, magnesium, sulfur, iron, lead and limestone – that can have a negative impact on you, your household and your pocketbook. Depending on where you live, contaminants from sewage, industrial waste and agricultural run-off can also seep into your water supply. If there are stains or buildup on your sinks and bathtubs … if you have to use large amounts of soap to clean dishes or wash your hair … or if your water tastes or smells odd, you probably have hard water. If left untreated, the minerals in hard water will cause yellow stains on plumbing fixtures and be deposited as scale, eventually clogging plumbing and shortening the life of appliances like washing machines, water heaters and dishwashers. Scale deposits not only cut down on the efficiency of these appliances, they cost you money, increasing both energy and maintenance bills. Water softeners eliminate the effects of hard water. In the Bathroom: Your soap and shampoo will lather better. Your hair and skin will feel noticeably cleaner, softer, and not as dry. And there will be no soap scum or mineral deposits to clean off sinks, showers, tubs and toilets. In the Laundry: Clothes will be softer, cleaner, whiter and brighter. Plus they will last longer. Using soft water and pure soap products increases the life of clothing, towels and linens up to 33%. Without hard water service issues, washing machines last longer, too. Soft water can save you thousands of dollars. Over time, soft water savings can really add up. For instance, conditioned water not only delivers greater washing power, it reduces the amount of soap you need to use by up to 70%. Soft water can reduce the bill for cleaning products in general by up to 65%. It can also eliminate extra rinse cycles and hot water. A related advantage is that using less detergent, household cleaners and chemicals is better for the environment. Softening water is a 4-step process. 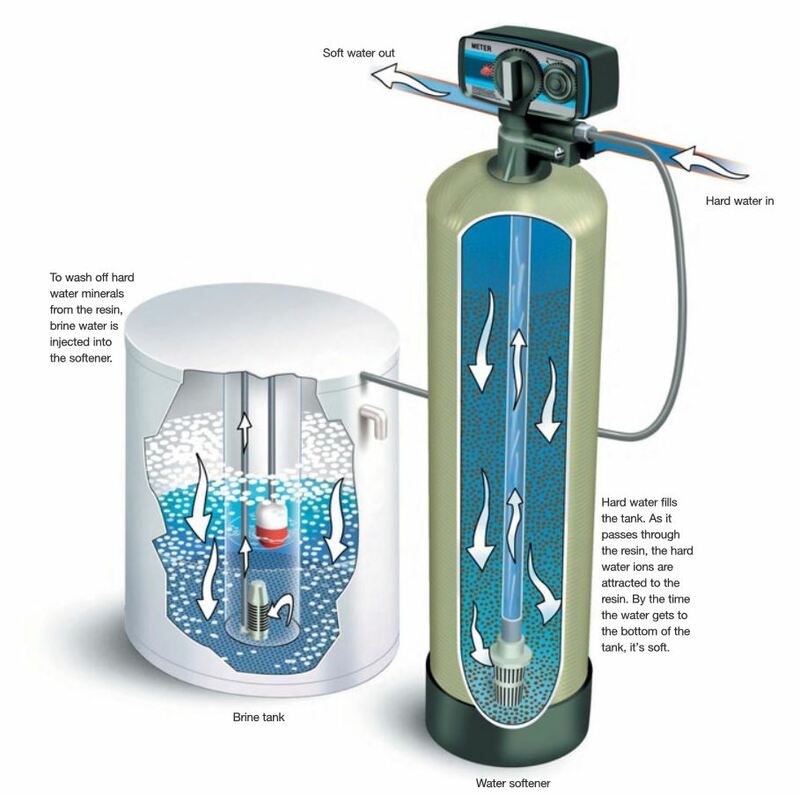 The body of a water softener is a tank filled with resin beads. These beads are covered with sodium ions. As hard water passes through, the resin beads act like a magnet, attracting the calcium and magnesium ions (hardness) in exchange for the sodium ions. Eventually the resin beads become saturated with mineral ions and have to be “re-charged.” This process is called regeneration, and is conducted by the control valve on the top of the tank. The control valve is the brain of the system. During regeneration, a strong brine solution is flushed through the resin tank, bathing the resin beads in a stream of sodium ions which replace the accumulated calcium and magnesium ions (hardness). The brine solution, carrying the displaced calcium and magnesium ions, is then flushed down the drain by fresh water. The regenerated resin beads can be used again and again. Water can be considered a universal solvent. As it passes from liquid to vapor and back again to liquid in its natural cycle, it has a tendency to dissolve everything it touches. In the air, water vapor can mix with sulfur from smokestacks, forming an acid which will eventually fall back to earth as rain, sleet, hail or snow. 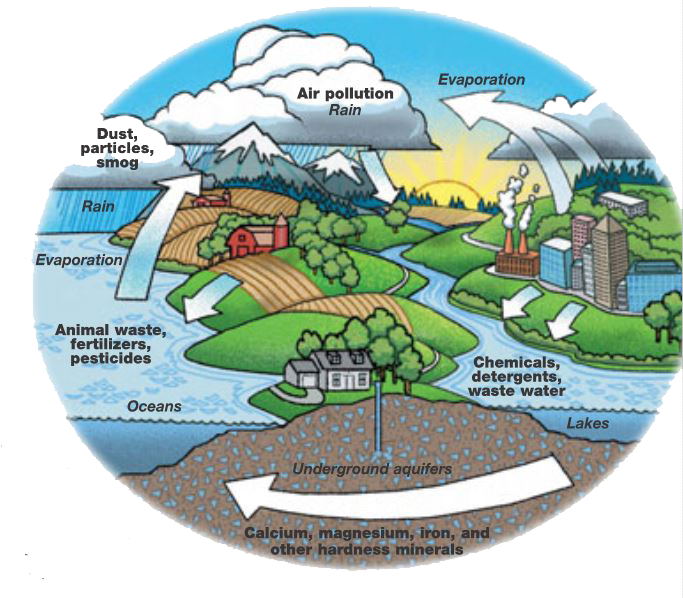 As water passes through the surface of the earth to the water tables below, it dissolves minerals and other substances it may encounter, including PCBs, bacteria, fertilizers and insecticides. 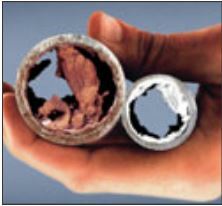 Even after reaching a home, water can continue to dissolve such things as lead from the solder in plumbing pipes. Hard water produces a scaly buildup which can clog pipes and appliances. 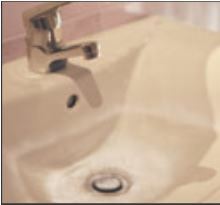 Hard water can cause yellowish stains on toilets, bathroom fixtures and clothing making them much harder to clean. 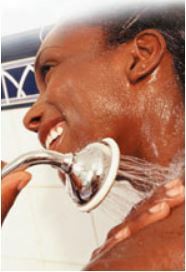 Hard water can also cause skin irritation. A water softener in your home will make you feel better bathing, improve the taste of water, and allow soaps and detergents to clean better. With softened water, soaps lather better and clean more completely. Water spotting completely stops, too.